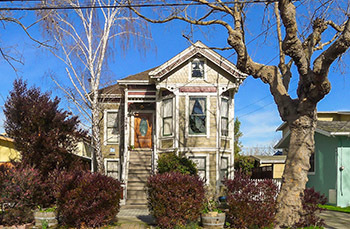 A home in Alameda’s East End neighborhood. The island of Alameda used to be considered a bit of a local secret, but times have certainly changed. With the announcement that Google is planning to open an office at the former Alameda Naval Air Station and the general shortage of available homes throughout the Bay Area, the island city has become a highly desirable location for both East Bay homebuyers and those coming from San Francisco, and its East End neighborhood offers plenty of pluses. Despite its recent changes and growth, Alameda manages to maintain somewhat of a small-town feel. The East End neighborhood proves especially popular with families or couples looking for a community in which to start one. Top-notch schools and mature parks are two major pluses of the East End. Lincoln Park is home to a pool, a rose garden, play structures, and baseball parks. The Alameda Beach is just minutes away, and features a walking and biking trail complete with a view of the San Francisco skyline. A mix of Victorian, Craftsman, Tudor, Mediterranean, and midcentury modern homes fill the serene streets. “Those looking to buy in Alameda tell me they are looking for homes with character,” says one of Pacific Union’s top East Bay real estate professional, who also happens to be a fifth-generation Alamedan. Park Street lines the west boundary of the neighborhood and offers an eclectic mix of locally-owned boutiques and restaurants. Popular Bay Area eatery Burma Superstar is a neighborhood favorite. Park Street is also home to a bookstore, several coffee shops, an indoor miniature-golf space, and an arcade. This busy, vibrant area features the historic, Art Deco Alameda Theatre, built in 1932. The Alameda South Shore Center is just minutes away, where residents can access major grocery and department stores. Additionally, the shopping center hosts a variety of kid-friendly events year-round, including an ice-skating arena during the winter months and a summer live-concert series. And for the commuter, Alameda’s East End offers easy access to three bridges leading to the freeway and the Fruitvale BART station in Oakland. AC Transit bus lines O, OX, and W offer service to San Francisco. Alameda also has two ferry terminals — one on the west side (Alameda Main Street Ferry) and one on Bay Farm Island (Bay Farm Island Ferry). A ride to the Ferry Building in downtown San Francisco takes approximately 20 to 30 minutes. The Oakland airport is a 10-minute drive and is also accessible via BART. Homes in the East End sold in an average of 16 days in 2015, according to MLS data. The average price for homes in this neighborhood in 2015 was $959,000, and the median sales price was $902,000. Currently, there are three active listings, with the average closer to 10 to 15 available properties during the busier months between March and November.